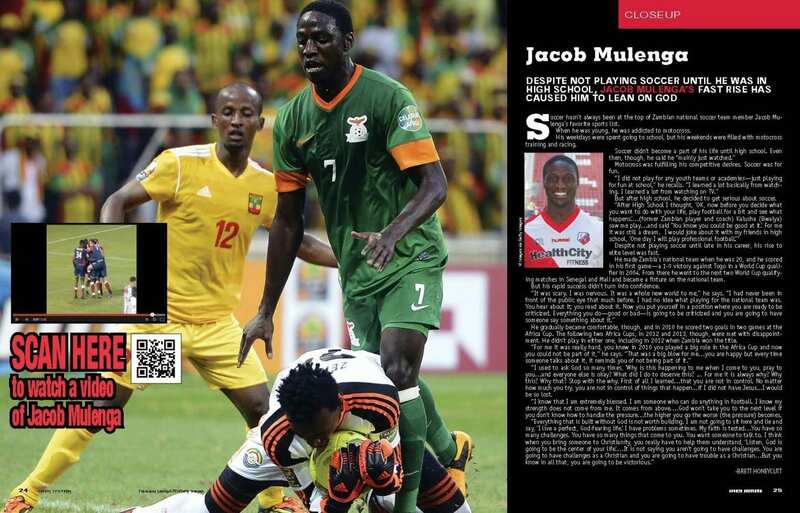 Soccer hasn’t always been at the top of Zambian national soccer team member Jacob Mulenga’s favorite sports list. When he was young, he was addicted to motocross. His weekdays were spent going to school, but his weekends were filled with motocross training and racing. Motocross was fulfilling his competitive desires. Soccer was for fun. But after high school, he decided to get serious about soccer. Despite not playing soccer until late in his career, his rise to elite level was fast. He made Zambia’s national team when he was 20, and he scored in his first game—a 1-0 victory against Togo in a World Cup qualifier in 2004. From there he went to the next two World Cup qualifying matches in Senegal and Mali and became a fixture on the national team. But his rapid success didn’t turn into confidence. He gradually became comfortable, though, and in 2010 he scored two goals in two games at the Africa Cup. The following two Africa Cups, in 2012 and 2013, though, were met with disappointment. He didn’t play in either one, including in 2012 when Zambia won the title. “I used to ask God so many times, ‘Why is this happening to me when I come to you, pray to you…and everyone else is okay? What did I do to deserve this? … For me it is always why? Why this? Why that? Stop with the why. First of all I learned…that you are not in control. No matter how much you try, you are not in control of things that happen…if I did not have Jesus…I would be so lost. “I know that I am extremely blessed. I am someone who can do anything in football. I know my strength does not come from me. It comes from above….God won’t take you to the next level if you don’t know how to handle the pressure…the higher you go the worse (the pressure) becomes.